This train, “Koshino Shu*Kura (越乃Shu*Kura)” was introduced in this past summer as seasonal cruising train. This train runs in Niigata prefecture. Niigata is known for one of the biggest production of rice in Japan. And also many kinds of premium Japanese Sake (rice wine) are produced by this rice in this district. This train has theme of Japanese Sake and you can taste many kinds of Sake on board. This train’s name, “Koshino Shu*Kura” means Echigo district (=Koshino) where the area train runs, Japanese Sake (=Shu), snow flake(=*) and brewery (=Kura). And also this train runs along the coast of Sea of Japan. You also can enjoy the beautiful scenery. My reader, James Chuang posted many photos of this train. He allowed me to use these photos and I was very impressed! I would like to share the photos and information with you. There are many steam locomotive trains in Japan. But this train, SL Banetsu Monogatari is only SL train that has Green seat. And it also has observation car, cafeteria and kids play space. I have received many nice photos of this train from one of my frequent reader, James. I would like to share the information of this train with you. JR Special Rapid Service, most useful train among Osaka, Kyoto, Kobe and Himeji. Posted on April 24, 2011 March 20, 2019 Categories Rapid service, Osaka, Shin-Osaka, Namba, Tennoji, Kyoto, Nara, Kobe, Himeji, Maibara, OgakiTags Himeji, Kobe, Kyoto, Osaka, Shinkaisoku246 Comments on JR Special Rapid Service, most useful train among Osaka, Kyoto, Kobe and Himeji. Many passengers are waiting for Special Rapid Service in Osaka station. Special Rapid is very popular for both commuters and the travelers. 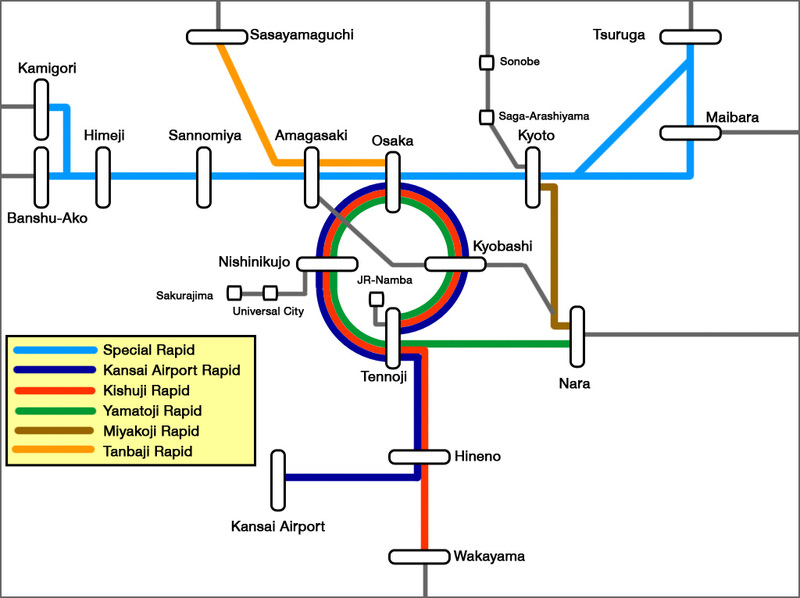 Special Rapid Service is the fastest local train that is operated between Tsuruga (=敦賀) and Kamigori (=上郡) via Kyoto (=京都), Shin-Osaka (=新大阪), Osaka (=大阪), Sannomiya (=三ノ宮), Kobe (=神戸) and Himeji (=姫路). 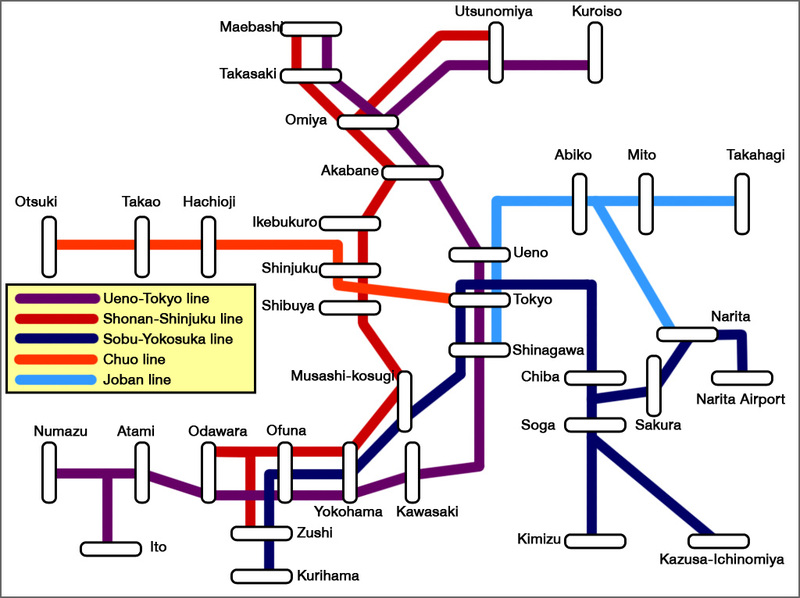 Especially JR West compete with Hankyu (=阪急) and Keihan (=京阪) between Kyoto and Osaka, with Hankyu and Hanshin (=阪神) between Osaka and Kobe. So JR West have to offer fast and good quality of services. As a result, the time required by this train is faster than Shinkansen between Osaka and Kyoto. Since Shinkansen do not have a station in downtown Kobe, this trains is faster than Shinkansen between Osaka and Kobe too. Of course this train is fully covered by Japan Rail Pass. Let’s see the details. Continue reading JR Special Rapid Service, most useful train among Osaka, Kyoto, Kobe and Himeji. Rapid trains on Shonan-Shinjuku line have green and orange colors.